The Realistic PRO-2025 is a rather simple 16 channel scanner. It is perfectly suited to add a discriminator output to it. 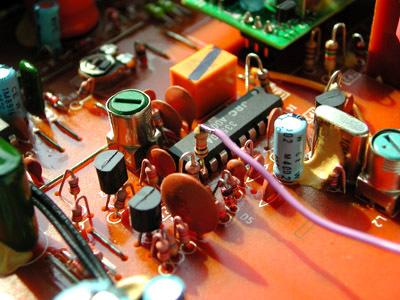 The PRO2025 uses a MC3359 receiver IC. The unfiltered audio can be found at pin 10. The scanner can be opened by removing 4 screws of the bottom panel. By disconnecting the loudspeaker connector, the bottom can be put aside to create more manoeuvering space. A 10 k resistor is soldered to pin 10 of the discriminator IC. 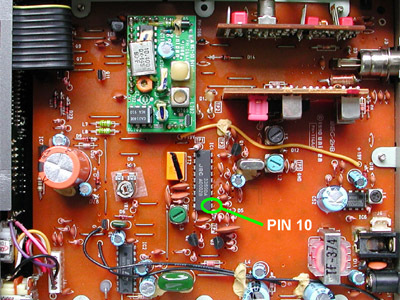 The other lead of the resistor is connected to a 3.5 mm chassis part by a small piece of insulated wire. The chassis terminal is mounted in the back of the scanner. 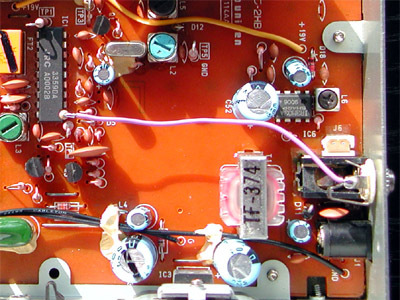 Because the scanner has a metal grounded case, separate grounding of the chassis terminal is not necessary. Also, given the short distance between the resistor and the chassis terminal, the use of shielded cable is not necessary.